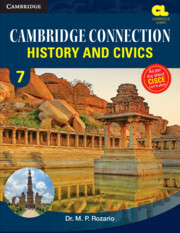 Cambridge Connection: History&Civics (ICSE) is a series of textbooks for classes 6 to 8. 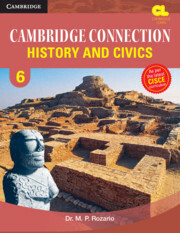 Cambridge Connection: History and Civics is a series of textbooks for classes 6 to 8, conforming to the new curriculum released by the Council for Indian School Certificate Examinations (CISCE). The series prepares students for the detailed study of History and Civics in high school, with enjoyment, interest and curiosity. The curricular area of History equips students with the knowledge and understanding of the past, necessary for coping with the present and planning for the future. The Civics section makes them aware of the socio-political life, and engages them as interested citizens of a vibrant and an on-going democratic process.